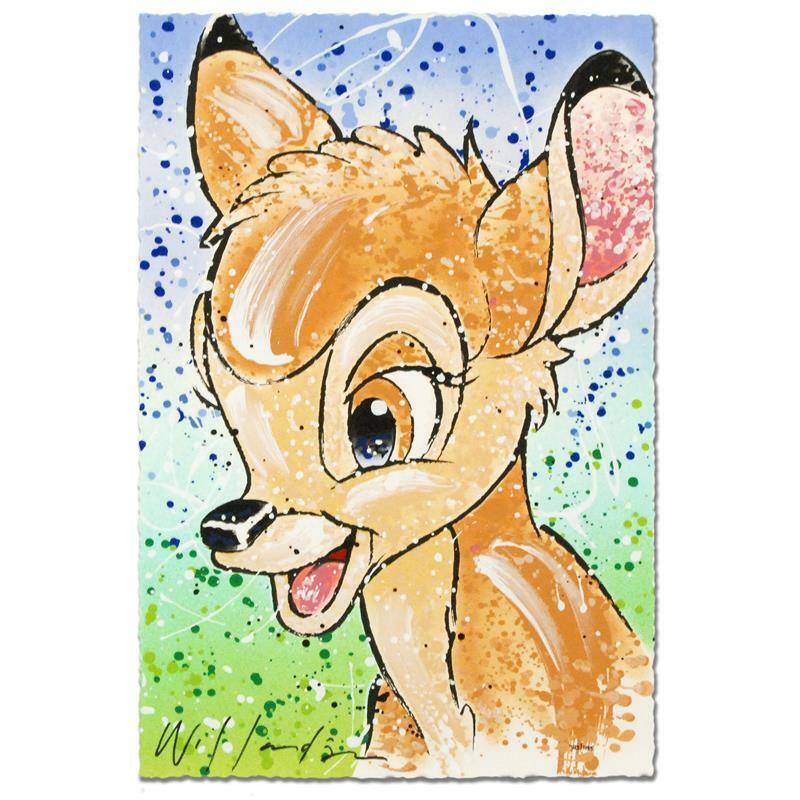 With careful details, loyalty to original Disney creations, and a unique, personal flair, David Willardson's artwork is perfect for the casual fan or the avid collector. 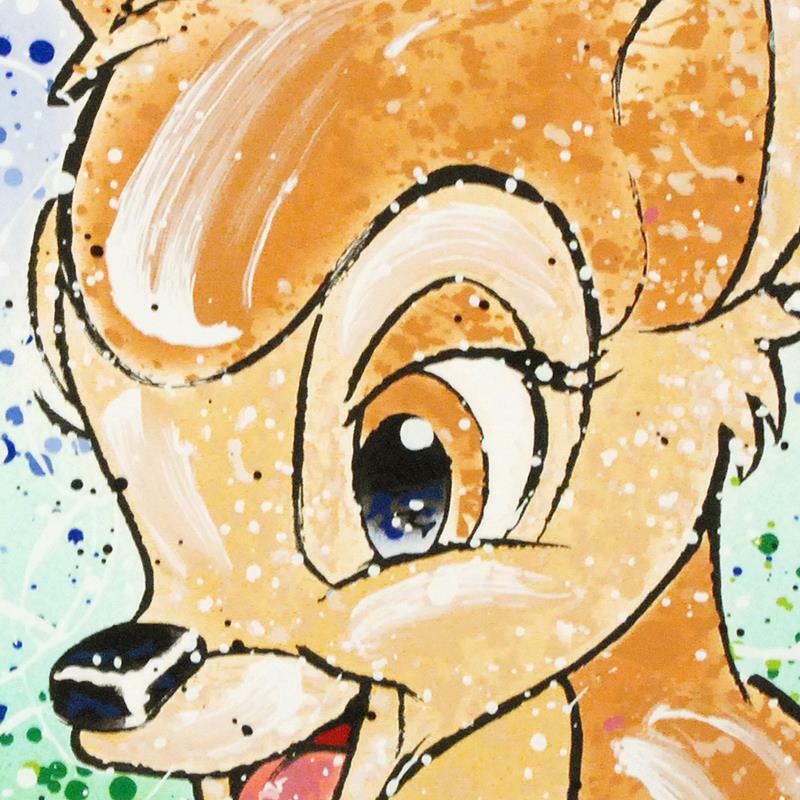 "Bambi the Buck Stops Here" is a limited edition serigraph on deckle-edge paper, numbered and hand signed by Willardson. Includes Certificate of Authenticity! Measures approx. 11" x 17" (no border). San Diego native and self-proclaimed California Boy, David Willardson, enjoyed a successful career in design and illustration before teaming up with Disney. He had always loved all things Disney--from the first time he visited Disneyland as a kid in 1955, to working there as a cast member throughout high school--but he never considered a professional relationship until he received a call from Jeffrey Katzenberg (head of animation at Disney) in the 80’s. Katzenberg had seen an illustration of Goofey that Willardson had done for a national ad spot, and asked if he would be interested in creating an entirely new look for the animated movie poster campaigns that featured the reissued classics and new movies. 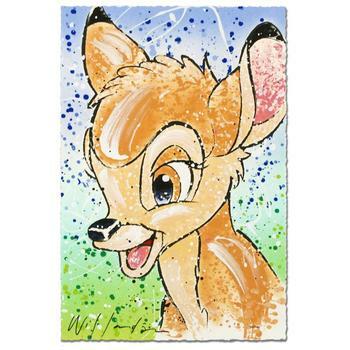 Then for the next 17 years, Willardson was the artist of choice for those Disney campaigns. Lurking behind his beloved Disney characters, Willardson discovered a team of animation geniuses that had left an indelible mark on American culture. He sought about learning their craft in order to figure out what made his heroes tick. "As a young kid, I studied them in minutiae," Willardson remembers. The first poster Willardson created for Disney (and Katzenburg) was for the re-release movie poster for "Bambi." His fully rendered images for the Disney animated movie posters are still the most widely used to date and include such well-known movie posters as: "The Little Mermaid," "Aladdin," "The Lion King," "Pocahontas," "The Hunchback of Notre Dame," "Robin Hood," "Beauty & The Beast" as well as Classics, such as "Snow White," Cinderella," "Pinocchio", "Jungle Book" (to name a few), earning him a permanent place in animation history.